Home / #Politics / #TrueNews / #WorldNews / #WorldNewsUpdate - City Hall of Naples,Italy. Major De Magistris has showed the Catalonia flag at his window. #WorldNewsUpdate - City Hall of Naples,Italy. 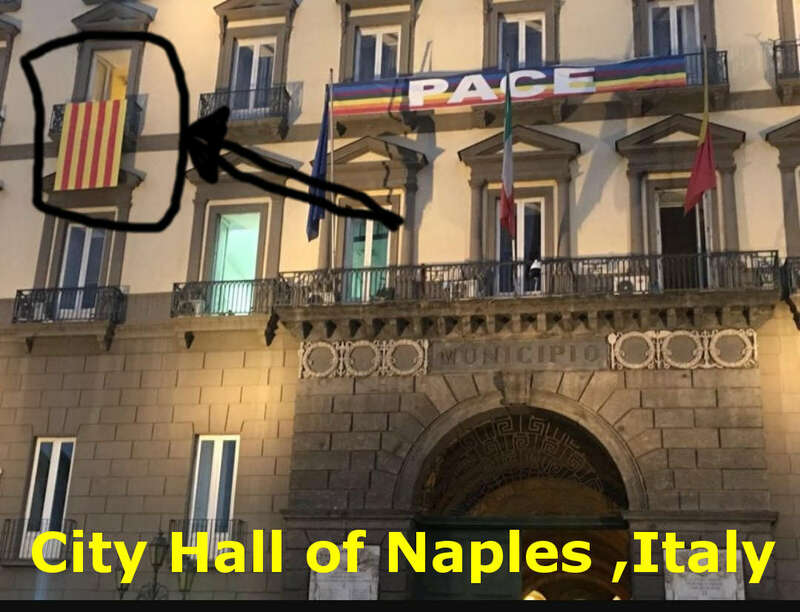 Major De Magistris has showed the Catalonia flag at his window. City Hall of Naples,Italy. Major De Magistris has showed the Catalunya flag at his window. Catalonia holds general strike in protest over referendum violence Flights and train services could be disrupted during strike to condemn police response to independence vote. Large numbers of Catalans are expected to observe a general strike on Tuesday to condemn police violence at a banned weekend referendum on independence, as Madrid comes under growing international pressure to resolve its worst political crisis in decades. Flights and train services could be disrupted as well as port operations, after unions called for the stoppage to “vigorously condemn” the police response to the poll, in which Catalonia’s leader said 90% of voters had backed independence from Spain. Barcelona’s public universities are expected to join the strike, as is the contemporary art museum and the Sagrada Familia, the basilica designed by Antoni Gaudi and one of the city’s most popular tourist sites. FC Barcelona said it would take part in the strike, adding that it would close its headquarters and that none of its professional or youth teams would train. “I am convinced that this strike will be widely followed,” the Catalan leader, Carles Puigdemont, said before the protest. Jordi Cuixart, the leader of the pro-independence group Òmnium Cultural, said on Monday that a general strike was “the best response the Catalan people can make to the attacks on us yesterday and in recent weeks”. The central government has vowed to stop the wealthy north-eastern region, which accounts for a fifth of Spain’s GDP, breaking away from Spain and has dismissed Sunday’s poll as unconstitutional and a “farce”. At least 893 people and 33 police officers were reported to have been hurt on Sunday after riot police stormed polling stations, dragging out voters and firing rubber bullets into crowds. Violent scenes played out in towns and cities across the region as riot police moved in to stop people from casting their ballots. The UN rights chief, Zeid Ra’ad Al Hussein, said he was “very disturbed” by the unrest while the EU president, Donald Tusk, urged Madrid to avoid further use of violence. “We call on all relevant players to now move very swiftly from confrontation to dialogue. 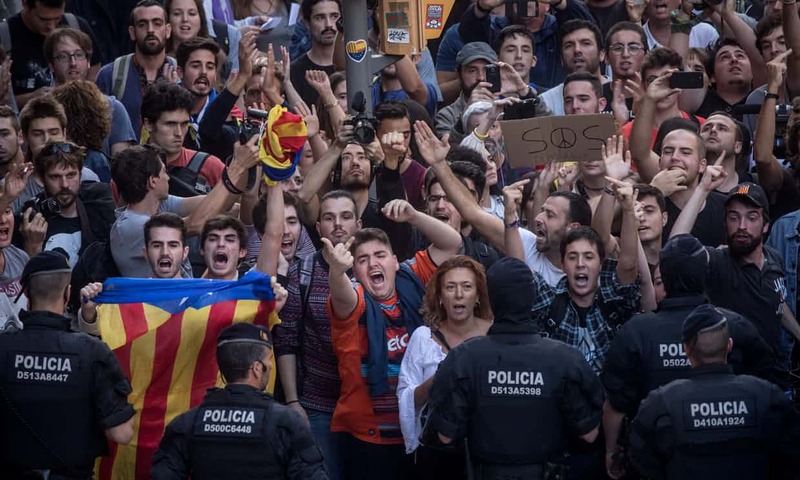 Violence can never be an instrument in politics,” the European commission spokesman, Margaritis Schinas, said, breaking weeks of virtual EU silence on the Catalan issue. Residents in many cities briefly stopped work at midday on Monday and descended on to the streets in silent, solemn protest. “This was the norm under Franco,” the crowd chanted, referring to the former dictator Francisco Franco, whose 1939-75 regime repressed Catalan language and culture. The government of the prime minister, Mariano Rajoy, held emergency talks after Puigdemont declared on Sunday that Catalonia had “won the right to an independent state”. The regional government said 2.26 million people had taken part in the poll, or just over 42% of the electorate.